If you send out massive staff notification mailings or business offers to your clients, if you manage a recruitment agency with a massive database, or even if you just find that personalized newsletters are a necessity – nothing else available in Office really comes close. Mail Merge has the ability to produce a virtually infinite number of copies of the same text document with any given user-defined personal variables. For instance, if you intend to send basically the same document as an email message to a number of recipients but include the personal information such as first and last name, home and business addresses, etc., you can do it as professional and accurate as possible using Mail Merge’s personalization tools. These tools allow to keep both the anonymity of other recipients from each other, and to greet each one of them using their own names and titles in the message body. This is scenario is done by conveniently placing the user-friendly macros beside the greeting lines and other critical points of the message during its composition in Word. Later, during the actual mail generation, Word accesses the designated contacts base – either the regular Outlook Contacts storage (thanks to the seamless integration between these Microsoft Office components) or an external data-source file (it could be any database-enabled file format – a Microsoft Access file or an Excel table, to name a few) and inserts the actual individual data of the recipient instead of the macro. As the result, each recipient will receive your intended message as if it were designed exclusively for him or her, with only their email address visible in the “TO:” field of the message and their own names and other individual data instead of the placeholders. We at MAPILab have been working to improve the Mail Merge tool and its personalization possibilities even further, and are introducing the Mail Merge Toolkit: a feature-rich add-in (a software upgrade which uses Microsoft Office as the main platform, while only including the necessary software library files as an addition to the primary pool) that aims to extend the list of available features with its own unique mass mail personalization and productivity functions. NOTE! The special offer is available now – 10% discount for Mail Merge Toolkit license! One of the most important and welcome additions has been the inclusion of the individual attachments in Mail Merge. Mail Merge with attachments opens even more possibilities to conduct business correspondence precisely and competently. The know-how is simple: to perform a mail merge with attachment, a file location is included beside the intended recipient in the data-source file, and after that – a special macro is specified within the extended Mail Merge finalization window’s “Attachment” field. A Mail Merge attachment will be sent and delivered to the unique recipient as seamlessly and conveniently as a regular file attached to an email message would. If there is no more than one unique recipient per attached file, you can even name your Mail Merge attachments according to the person who is going to receive it (multiple recipients who are going to receive the same file, or even split bunches of recipients and different bunch-dependent files are possible with the Mail Merge with attachments feature as well). With the most recent version of the Mail Merge Toolkit add-in, you can also send your documents as .PDF attachments or as data in the message body during in your mailing. The special offer is available now – 10% discount for Mail Merge Toolkit license! I have downloaded a trial version and gone through all the processes to send a mail merge to five recipients with 8 attachments. However the mail merge doesn’t appear to send. I get as far as accepting that the mail merge will be sent with attachments and then accepting the message delay but then nothing. On the tutorial video I watched a pop up box appeared with a summary of the actions. I don’t get that. Can you help? 2) Uninstall current version from your computer through the menu “Start > Settings > Apps > Apps & Features”. 5) Unzip the package, double-click the setup file relevant to your bit-edition of Office (it could be either 32-bit or 64-bit), type in the administrator’s password, if necessary, and install the software “Only for me (Current user)” during the third step of Installation Wizard. I have noticed in Outlook that the file OutlookSenderAddin.dll doesn’t appear and if I try to add it, nothing happens. Would this be the reason and how do I overcome it? 1. First, please close Outlook, Word and Publisher (all instances) – then, open Task Manager and check: outlook.exe, winword.exe, and mspub.exe should not be listed under “Processes”, and if they are – please terminate processes. 4. Then, start new installation of the add-in. 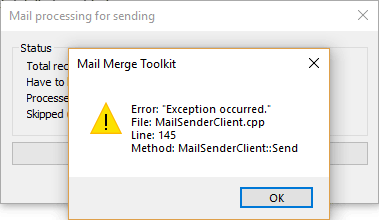 I keep getting the following error when I try to run the mail merge. 1. If you use an Excel file as data source – please close it before merging messages: if it is opened for editing, the system is unable to access data. 2. 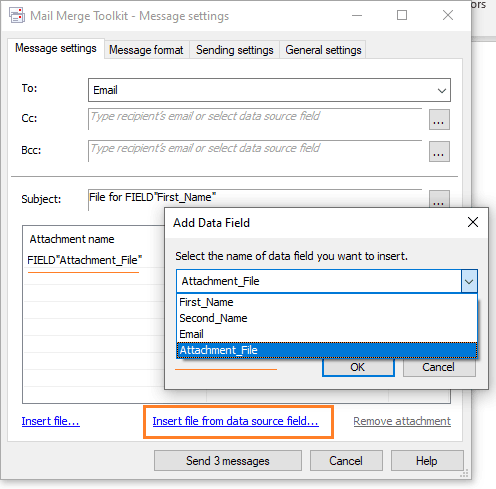 Please make sure your e-mail data field is selected correctly in the “To” field of the add-in settings – that data base field should contain recipients’ data with the e-mail address. Please check your data source as well. 3. That error message (“Requested object is not available”) is known when recipients are excluded (deselected) at the step 3 or the mail merge wizard, or when that selection in the regular filtering system (in the 3rd step) does not correspond with the add-in filtering system (“From: … To: ….” or “Current record”). a) please go back to the 3rd step (or click “Edit recipient list”), select only the recipients you wish, then select “All” in the add-in settings – the add-in will send merely to your selected at the 3rd step addresses in this case. Or, b) if you wish to use the add-in filter (From: … To: ….) – please select all your contacts at the 3rd step of your Mail Merge wizard, then specify the range in the very last step, in the add-in settings dialogue. I am using the trial to just send one test message from a very simple list of just the email address and the PDF filepath I want to attach. The Excel file I’m using as a database is not open when I am doing the mail merge. It gives the same error no matter if I attach the filepath or try to send with no attachments. I am frustrated that there doesn’t seem to be any support for the trial – someone I can call. Please advise. Hello Nichole, thank you for your question. This error is known now with different issues – I described all known ones, unfortunately, the text is rather large. Would love to purchase the product if I can find out how to adjust this. Hello Joe, thank you for your question and sorry for the delay in answering it. User data may be retrieved that way from an Exchange mailbox. 1. Could you please test if the regular “Electronic Mail” or “Finish&Merge” Mail Merge options work in your system without issues and send messages to/via Outlook ? If you select that account as the default on – does regular Mail Merge send messages with normal personal names in the headers ? I have installed the free trial toolkit as an add-in but when I try to send an email I get an error saying “Invalid Pointer”, I have checked to see if it’s disabled in the options section of word but it seems to be enabled already. Any idea what the problem is and how I could resolve it? Quick question: I wanted to send my merged emails with a delay between each one, i.e., I have 78 emails, but I want to send them with a 3 minute delay between each one. I don’t want to send ALL 78 at the same time after 3 minutes. Is this possible? Getting this error message. Have about 180 records to send and about 50 of them will not send. They show up in my DRAFT folder without an email address attached. However, all my records have email addresses. Please help! Hello Emoree, thank you for your question. Could you please make sure your e-mail data field is selected as the To-recipient correctly ? This error message is known in case where the “To” field is empty. The add-in is unable to generate messages if no field for the main recipient is selected – so, such parameter is really incorrect. Our Mail Merge Toolkit software works as follows: for every single recipient (field, or record) selected in the “To:” field, Mail Merge Toolkit generates personal message, that single recipient will not see other recipients – each recipient will get his single personal message with merely his personal data. Hello Tom, thank you for your message. Whenever I try to attach individual attachments using a field from my excel doc that is hyperlinked to each individual document on my drive, I get a message back saying, “the following file is not found or is inaccessible and can not be attached to the message.” However, when I click on each of the links in my excel document, the PDF it is linked to always pops up. Hello Jenna, thank you for your question. I want to send out the email with attachment through mail merge toolkit, but it stated ‘Unknown error 0x800A14EB’ and failed to send out. How can I solve this? Thanks! We’ve fixed this issue in the new version (which also includes several new major features), which is due for release this December – please subscribe to our Newsletter (at the bottom of this page) to get notified of the update the moment it goes out. My email messages are sitting in my Outbox and won’t send. I have re-booted, made sure that the AddIns are ok, I think,. Please can you help? Hello Kate, thank you for your question. Full registered add-in version does not impose any limit on the number of messages – it will generate messages for all TO-recipients (with CC/BCC-recipients if you have them) and place them all to Outlook Outbox. But limitations may be applied here by e-mail system (mail server) – in such case, your messages may stack in Outbox, or even returned by the mail sever. Please contact your e-mail service provider or mail server administrator with the question if they have limits for outgoing mail. a) Run the “Compact now” utility in Account Settings-> Data File (if this option is supported by your mail store type) – that fixes issues with the mail store. Hi! Can we use the Reply From Address feature of Outlook using Mail Merge Toolkit? Hello Mickey, thank you for your question. You can configure separate email account with the custom Reply-To address, then select that account in Mail Merge Toolkit – and general Outlook setting for that account will be applied to the messages generated by Mail Merge Toolkit as well. But if you mean that specific Outlook feature available in the single current message options which allows selection of the reply-to address for every single message (as well as the delay, and receipts) is unfortunately unsupported – because those changes are applied while the message is being edited in Outlook. Our Mail Merge Toolkit places messages to Outbox directly. How many emails can be sent in a day using mail merge took kit? For Ex:- I want to sent 3000 emails per day. Is it possible? Hello Prakash, thank you for your question. A limitation exists merely with the trial version: it starts generating messages, places them to Outlook Outbox – and after 50 ones, correctly reports about the trial limitation. The registered add-in version doesn’t impose any limitation to the number of messages can be created and sent. If you have ever experienced any trouble while performing large mailing – probably, your ISP or mail server settings limit outgoing mail – such setting existis on most mail services. Please contact your Internet Service Provider (or, network/mail server administrator) in order to clear this issue up. The ISPs usually have such a limit, but offer a possibility to enlarge the number of outgoing messages for extra fees. Mail Merge Toolkit just generates personal messages – as many messages as many recipients’ records are there in the selected data source; and places them all into “Outbox”, and here, the operating zone of the add-in is finished, all the messages should be sent by Outlook and mail server after that. Need someone help to crack this error from toolkit. I tried to disable and enable the add-ins in Outlook and also in Word, but no luck. Hello Aj, thank you for your question. Could you please check if the regular Mail merge function works OK in your system ? If if opens its dialogue – please select HTML format and try sending. File-> Options-> Add-Ins-> “Disabled Items” – highlight the add-in in the list and hit “Enable”. 5) Please check the very 1st Mail Merge Wizard step as well: if “Letters” is selected – please change selection to “E-Mail Messages” (the default “Letters” selection is intended for printing only, not for e-mail). 6) If you select “Use default account” – please select the account manually from the list (even the default one, please also test with other accounts). a) Please run the “Compact now” utility in Account Setting-> Data File (if this option is supported by your mail store type). I have the same issue, and tried to enabled this add-in in Outlook, but there no related one as my attached image. Can you pls help advise? Dear Kai Le, thank for your question. 1. Close Outlook and Word (all instances) – then, open Task Manager and check: both outlook.exe and winword.exe should not be listed under “Processes”, and if they are – please terminate processes. - extract the proper setup file to a local folder. 7. Once installation is completed, please start Word and follow First Start Wizard. 8. Please open Outlook after that and make sure the add-in is now listed in COM Add-Ins – and disabled and enable it for sinple troubleshooting. Can I attach multiple files using mail merge toolkit?? Please advise. Hello Suraj, thank you for your question. Yes, you can attach multiple files – as many as you wish: please click on the “…” button next to the “Attach” field. New dialogue window will open – you can add all your files to the list: attach static files, or add your data source field with the path to your file; and also remove your previously added files from the list. Question is if you can attach multiple files using excel and under the Attachment file header you provided?? If so, how do you enter the two file names in the field. Hello Angelica, thank you for your question. 2) or, in the Excel data file, you can add multiple columns (data fields) with the paths to your different attachments. Single data field for single file. Adding multiple filenames to single cell is not supported – the system will not recognize such command. Hello Inga, thank you for contacting us with this issue. 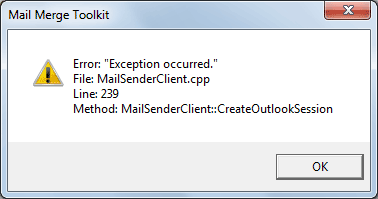 The “Exception…” error message states the program fails to launch its Outlook component – either due to technical issues with Microsoft Office Outlook, or because the add-in is disabled in Outlook. *4) If it is not listed among Disabled Items – please remove the tick from its check box in COM Add-Ins, click OK, then point back – and put the checkmark. This procedure runs troubleshooting and should fix possible issues. Hi, I have come to the step asking to “Choose account”. The profile is Outlook, which I’m using but the drop down option only provides my personal work email. I want to send emails from another account which I also use in Outlook. How do I add another account to the Mail Merge Toolkit? Hello Kathy, thank you for your question. 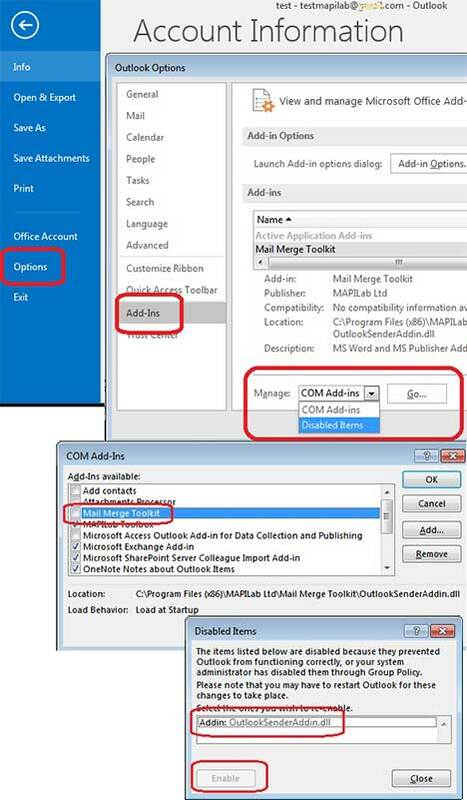 Our add-in enables Outlook account selection for the regular Mail Merge feature. If you can configure that second email address as the new separate Outlook e-mail account – you will get that selection with Mail Merge Toolkit. The add-in does not support specific Outlook feature for sending on behalf of another user (delegate access, or the “send as” option), but it supports selection of separate accounts configured in Outlook. To how many users we can send emails per day using mail merge toolkit? 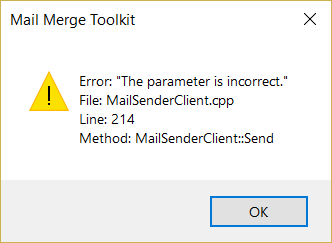 The registered versions of Mail Merge Toolkit do not have any limitations to the total possible number of messages you can send per-run. How many emails can be sent per day. Is there any limitation on no. of emails sent out per day? Can I add 40 users email ID’s in the “TO” field in purchased version? The registered version of Mail Merge Toolkit is no different from the Trial version in that regard: Outlook has a limitation on the total number of characters in the “To:” field (for backwards compatibility purposes), which is 256 characters. We can suggest dividing the mailing into smaller batches, or using separate columns in the data-source with one address per-recipient to avoid hitting this limitation. When will the 256 character bug be fixed? We often have to manually send out emails with recipient lines over the 256 character limit, since the merge will fail. This seems to be an important missing feature; is the limitation due to outlook itself? Hello Pat, thank you for your question. I’m not sure that is a kind of malfunction: our add-in does not impose any limit for the fields, but such limit exists in Outlook and in Windows: Outlook may limit the length of the field to 255-256 characters with POP accounts (or to 32KB on Exchange), and so it cuts the rest of data if the cell contains numerous emails. So, our add-in can help you with this limitation if you add a data field to the CC or BCC field – but you will need to control the data length in the cell (if you use an Excel file), if your Outlook limits the length of the message recipient field. I installed the mailmerge toolkit today and am very happy with it so far. BUT all my margins in Word have mysteriously been set to 34cm for all my documents. I have tried everything to move the page width back but with no success. Assuming the issue was indeed caused by Mail Merge Toolkit – it is not a known one, unfortunately. Can you please explain the difference between Mail Merge Toolkit and Mail Merge Toolkit PRO differences? The main difference is that a couple of features is exclusive to Mail Merge Toolkit PRO: the first one allows connecting to a SharePoint list using it as a data-source, and the second feature concerns a certain attachment style. - Personalized attachments: the Word document will be converted to an attachment of chosen type, allowing to optionally fill the message body when finalizing the mailing. Mail Merge Toolkit Standard is capable of the first two attachment types, while the Mail Merge Toolkit PRO includes all three. When I enter 10 email addresses in excel sheet and imported into word using mail merger toolkit It is not allowing us to send an email to all the 10 users. Mail merge toolkit automatically removing other 2 emails addresses and adding only 8 email addresses. Is it limited to 8 users only in trial version? Please advise? The registered add-in version doesn’t impose any limitation to the number of messages can be created and sent. The trial add-in version will generate messages for 50 records, and will show the correct notification once the limit is accessed. It looks like you added all your addresses to a single cell – so, your record contains several recipients, and they will be added to the “To” field of a single message. And here, Outlook limits the length of the recipient fields (To, CC, BCC) to 256 characters. So, if your single Excel cell contains more characters – Outlook will allow adding 256 ones to the message recipient field, and will cut the rest with POP accounts (with an Exchange account, that limit may be set to 32 KB). Please note: with such data field, all your recipients (up to 256 characters) will be added to your message TO field – the message will not be personal. If you wish to send individual e-mails for single recipients, please create an Excel data file with personal records (the row = the record, by default; single cell data = the value of a single data field). My workplace has approved and install the Mail Merge Toolkit to my pc so I can use Access contacts to create a mail merge with attachments. I have managed to complete the mail merge up until I receive the error message from the Toolkit box saying “Missed Attachment file” and gives me options to skip or stop sending. I know the file is there as I had just added it as to the Attachments field in Access and then updated the recipient list to ensure it was included. Help? Hello Bernice, thank you for yoru question. It looks like your data field contains merely filename and extension – and the path to it is not specified. Hello Robert, thank you for your question. 0) Please test if the regular Mail Merge functions on the same computer as expected. (Our add-in is the extension of it – and requires this function). Hi I am getting the same error message. I tried all the recommended actions and a regular mail merge worked for me but I am still getting a very similar error message. Any ideas? but nothing happens? I plan to purchase this if I can make it work. Hello David, thank you for your quetsion. It looks like the add-in is not installed for your current user (absent in File-> Options-> Add-Ins). Most probably, you installed it as another user (Administrator) with the setting “Only for me”. - Close Outlook, Word and Publisher (all instances) – then, open Task Manager and check: both outlook.exe and winword.exe should not be listed under “Processes”, and if they are – please terminate processes. - Uninstall the app from your computer through the menu “Start-> Settings-> Control panel-> Add or Remover Programs”. We installed Mailmerge pro with our licence on Win 10 + Word 2016. Hello Stefan, thank you for your question. 1. If you use the format: “PDF/RTF/HTML Attachment” to send your document content as attached file, and select a data field to retrieve your attached file names from the data source – please test with another value, e.g. the first and default one – “Use document name as attachment name”. 2. Save your Word file and changes in it before going to the last Mail Merge step. Please try to select the old format – “Word 97-2003 Document (*.doc)”. If you use an Excel file – please save it as the old .xls format as well. 3. If you select “Use default account” – please select the account manually from the list (even the default one, please also test with other accounts). 4. Please check the very 1st Mail Merge Wizard step as well: if you select “Letters” as your Mail Merge type – the issue may be related to that selection. Go back to the 1st Mail Merge Wizard step and select “E-Mail Messages” in the very 1st Mail Merge Wizard step (the default “Letters” selection is intended for printing only, not for e-mail). Next, please go to: [\MAPILab Ltd\Mail Merge Toolkit\] – and locate the .log file with the name of your default Outlook profile, by default “Outlook” is used in the systems as the mail profile name, but your e-mail address may be also used as filename. Hello Sharon, thank you for your question. Please copy the path of your failed attachment, paste it to Start-> Run, and hit Enter – to see your file is available that way, or not. If the system opens your file that way – our add-in will also find it and attach. If you wish to attach several files from a folder – you can replace file name with the file mask (file. *; or *.ext; or *.*). Hi, we brought the toolkit and upgraded it, but we found we cannot modify the attachment name if we selected HTML, FILTERED. Could you please give us some suggestion? Hello Catherine, thank your for your question. Modifying attachment name can be only applied if the format: “RTF/HTML/PDF Attachment” is selected – so, your Document text will be converted to a file, and that individual file will be attached to your outgoing message. You can configure renaming this personal file using data from your data source, or the document name. With the “HTML Filtered” format, your Document text will be inserted to the HTML message body. Existing files, selected to be attached to personal messages with the add-in option “Attach”, can not be renamed that way. I installed mail merge tool kit trail version but the option cant appear in my MS WORD please help. Also, please check that the add-in is enabled in Outlook as well. The name of the Outlook component is OutlookSenderAddin.dll. I am getting Invalid Pointer Error. Can you please help me? Hello Mahesh, thank you for your question. The error message exactly stays the add-in fails to launch its Outlook component – either due to technical issues with Microsoft Office Outlook, or because the add-in is disabled in Outlook. In File-> Options-> Add-Ins-> “Disabled Items”, highlight* the add-in in the list and hit “Enable”. 3) If it is not listed among Disabled Items – please remove the tick from its check box in COM Add-Ins, hit OK, then point back – and put the checkmark. Error : A microsoft software installer error was encountered. Hello Sahil, thank you for your question. Please see our specialist’s reply to an earlier comment here. Can I email merge individual .pdf documents with password protection. I need to use one password for all generated .pdf documents. I tried to protect my files before sending them, but it didn’t work. Could you please help? Hello Lisa, thank you for your question. Our add-in uses the PDF-convertor built-in into Microsoft Office Word, it has limited functionality and does not provide the option for password protection. Therefore, unfortunately our Mail Merge Toolkit will not support this feature either. We offer an add-in for Outlook which can archive attachments in outgoing mail into password-protected ZIP files. I like to know is there a way to check the attachments and email addresses after the mail merge is completed and just before i click send in outlook? As i have many different attachments and many recipients to send to. There are times the attachments is not for the correct recipients. or just switch to “Work Offline” at the Send/Receive ribbon tab. In Outlook XP-2007, you can disable “Send immediately when connected” in Tools-> Options-> Mail Setup. Please also check your settings for “Send/Receive groups” – they might be configured for sending by schedule. Hi sir,This is Deepthi.How to forward job description to different mails to multiple persons with mentioned the name in the outlook.please explain me. Hello Deepthi, tank you for your question. Its option do not appear in Outlook, but enabling its component in Outlook is necessary as well. When I merge attachments, the name of the attachment in the message is changed into the full path, as stated in the merge field. Is there a way to keep the original name of the attachment in the message? In order to do that, you might have to make a dedicated column in your data-source with the desired attachment names alongside the path column. You will then be able to specify the attachment name field in your document and the resulting messages will show the actual names instead of the paths. Thank you for your reply, but I cannot get it working. I am merging with the option HTML-filtered but I can’t enter a value in the “Full Path” column, only in the “Name” column. When I select a static file with the “Add File…” button, the “Name” column and the “Full Path” column are filled with correct values. Don’t ask me why, but after I started from scratch with the addressfile (excel), it worked! This is a long shot. We successfully installed and used the Mail Merge Toolkit last year. It was removed during some PC cleanup and so I have bought another licence but keep getting an error message. We have tried on multiple PC’s and get the same error. My tech guy has run out of ideas having tried at least 20 times. Any ideas we can try as a last gasp effort? Hello Brian, thank you for contacfting us. And start installation from that extracted setup file: just double-click on the setup file, then keep the “Only for me” selection in the 3rd Installation Wizard step. In the next step, you will be probably offered to enter your Administrator login and password (if required). Hello Abraham, thank you for your question. The “To” field can not be left empty – you will need to select there any field from your data source. Even if you wish to keep that field empty in your outgoing messages, you can create a data field in your data source – and keep empty entries there. Mail Merge Toolkit will “insert” empty values to your message TO field if you wish. But since the add-in (and the regular Mail Merge as well) generates personal message for each recipient, we usually recommend to avoid using CC and BCC fileds, except the cases where you really need to send (blind) message copy to a secondary recipients. 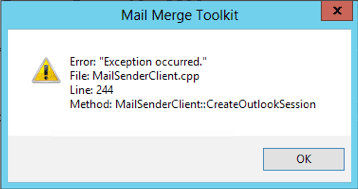 I am using a non reg version of mapilab, trying to to a mail merge to outlook 2016, using windows 10, i was successful in my test with a few email addresses, now i am trying to send an invitation to 500 email addresses, i get an error (attached picture) MMTProg error, the Parameter is incorrect. is it possible to add code so that it also pulls in my normal email signature? The signatures configured in Outlook, unfortunately, can not be added automatically to the message body if you start writing your message text from within Word or Publisher. But you can add your signature as custom field to your data source (if you use e.g. an Excel file). And just select that field upon writing your message text in Word or Publisher. Please test how it works with your signature – because some objects (images, links, text formattings) may be inserted incorrectly, so you will need to select the ones which can be processed OK if using the Mail Merge feature. Hello Laurence, thank you for your question. Please save the document – and in the next step, you will get the next mailing option (which one – depends on your settings and Outlook configuration). That behaviour is not incorrect: the “Save file as” dialogue is initiated by Microsoft Word. The system requires that saved document to start generating personal messages. Until saving file, merely its temporary copy exisits, and some merge operations are impossible with the tmp files. I am hoping you can help me. I have just downloaded the trial version to see how the program works. I watched the tutorial and everything seems to input correctly but on the final stage when I want to send the test emails it just brings up the Save As option and doesn’t send the email merge. Is there something I need to do to link word with outlook? I am using an excel spreadsheet, to send mass mails via the mail merge toolkit. My Excel sheet has a column with specific attachment field paths. But i am being limited to one personalized attachment per person. I do not want to send more than one mail to each recipient, but these recipients have more than one personalized attachment. How do edit my excel sheet, so that when i complete the mail merge, it picks up all the necessary attachments for each recipients? I want only one mail sent to recipient 1, but i need both the attachments sent to him. I have too many recipients, and i don’t want to create several excel lists for each recipient. Is there a way to attach more than one in the excel sheet? Hello Karen, thank you for your question. I am trying to do a mail merge with attachments in the form of zipped file. I was successful in earlier attempts but now I am facing the below error. Can someone please help what does the above mean? Your help will be highly appreciated. This was happening to me as well. It happened when the cc field included both a merge from the cc column in the spreadsheet and an email address I had manually typed in. To fix it, I put the manual email address BEFORE the merge field. So, in the cc box I did: abc@abc.com; Field”cc” (NOT Field”cc”; abc@abc.com). I received a similar error when one of the cc fields from my spreadsheet included a trailing semicolon (abc@abc.com; was in the spreadsheet). Hope this helps. Hello Ted, thank you very much for your explanation and information. We tested this case – but unfortunately, could not recreate it. We will sincerely appreciate if you could repeat it with enabled logging – and send us your logs via e-mail. Please select “Verbose Info” at “General settings”. I am trying to use trial version. But I receive below error. This error messages appears when the data source field is not chosen in the add-in’ settings dialogue, or when the selected email address field does not contain email addresses. Please go back to the 3rd Mail Merge Wizard step and see your recipients’ email addresses, or click “Edit recipient list”. Once you know your email address field – please select it in the add-in settings and proceed. I continue to get the Line 211 Error message. I verified all emails are valid and active on the spreadsheet so I’m thinking that the issue must be that the data source field is not chosen in the add-in’ settings dialogue. Can you describe exactly how to update this setting? Do I change this in outlook or on the Word file? Our specialists will gladly assist you with this matter in the Trouble Ticket area. Hi, Is there any way to just send the text message in the body message but not included as a separate file in the attachment? I just want to send massive e-mails with a text message in the body message and different pdf files attached. Hello Federico, thank you for your question. Yes, you can select between 6 message formats: with “HTML Filtered” and “Plain Text”, your main document text is placed into message body; with other 4 formats – the add-in exports your main document text to files and attaches them to your message. Optionally, you are offered to type your text for the message body separately in the new dialogue. If your Word document contains merely text (without formatting), you can select “Plain Text” as message format, and attach your files in the “Attach” field. If your Word document contains grafics or/and formatted text, please select “HTML Filtered”, and attach your files as well. And sorry for missing this update here in this conversation. I am using Windows 2007 and trying to use the attachment feature using the format “HTML, filtered”. When I send it I get a box that says “missing attachment file: the following file is not found or inaccessible and can not be attached to the message.” I’ve checked the file path in the excel database various times and it’s the correct file path for each attachment. Not sure what I should try next, any help is highly appreciated! Please copy the path of your failed attachment, paste it to Start-> Run, and hit Enter – to see your file is available that way, or not. We will readily answer your further questions. I’m using Windows 10 + Office 2013. 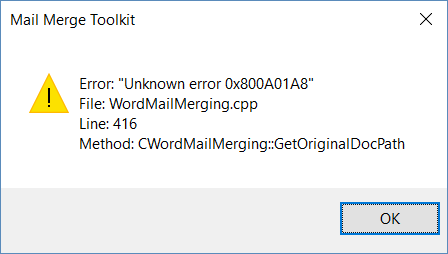 In Word when I come to the point, that the mails should be created by Mail Merge, I get the attached error message for each mail to create. I have to click “OK” on and on the get all mails created. Mail Merge creates the mails including different attachments, but I can find them at the Drafts AND the Outbox Folder of my IMAP mail account. Next problem: I can’t delete them from Drafts. Anything is blocking the IMAP sync with my mail provider. Because the mails can be deleted by using web mail, but they still appear in Outlook. Any Ideas about this various problems? Our tool saves the interim copies of individual messages to your Drafts folder. Then, the messages are being placed to Outbox and removed from Drafts. When you configure IMAP account, Outlook creates a local mailbox copy as the OST file connected to your account. And issues with deleting messages from its folders are known if that local mail store is long time in use or large. 1) Please run the “Compact now” utility in Account Settings-> Data Files-> select your OST file-> Settings-> Advanced-> Outlook Data File Settings-> Compact Now – that fixes issues with the mail store. Thank you Olga for the answer. 1. compressing the ost file didn’t help. 2. repairing the ost file did something, but nothing good. After repairing I tried to delete over 100 files in Draft, which were only local, but couldn’t. Instead my Outlook started to send them again. Until I was able to stop these sending, a lot of my customers got old mails and I got angry answers. I’m really really disappointed about this piece of software. Almost everything has been intuitive. I have just one question. I am sending out 800 merged word document as a RTF attachment. In my testing the recipient is getting a message that by opening the document it will run an SQL command: basically asking if you want to link to the data source (which they won’t be able to and I dont want them to). If you say no – it behaves like a normal merged document. Unfortunately the mere fact that the message appears will confuse most people. We could recreate this issue with some specific configuration, and will fix it soon (hopefully, till the 20th of May). We appreciate your information very much, and will let you know once the fix is available for download. We will appreciate your understanding, and will readily answer all your further quetsions. Olga T., support specialist at MAPILab Ltd.
How are you going to your planned timeframe? To get the fix do we re-download the app? We informed our customers via e-mail, but I am sorry for missing to publish this information here. Yes, you can add multiple recipients to all fields: To, CC, or BCC – please separate them with the semicolon (;). The “To” field is generated based on your data source records: your single record may include single email address in one data field, or several ones (e.g. 2 or more addresses in a single Excel cell, separated by semicolon). The add-in generates 1 message for 1 record. In the CC/BCC field, you can just type all your addresses, or you can also type your recipients in your data source: e.g. in an Excel file, please create a separate data field for CC or BCC – and type your addresses into the cells. The length of a single message recipient data (name and email address) is limited to 255 characters according to RFC 822. If you add several recipients to the CC field of your database – please make sure the length of all their addresses and names (if you use the format: User First ), does not exceed that limitation. Outlook will just cut the rest without any notification. You can also check all your recipients in Outbox before sending (switch Outlook to “Word Offline” for that). Exchange Server may also limit the size of data in a single recipient field – to 32 KB, or according to your server settings. I have used the tool several times to send our mail merge documents as a pdf attachment. Generally I just type in a short test message in the message body dialog that comes up – but now I need to include an image in the message body and I can’t figure out how to accomplish that. We will add support of graphics as new feature in the next version. In the current version, if you select sending your main message text as attachment, you can type your text and use data source fields in the message body – but adding images is not supported with the recent version. We will appreciate your further questions and suggestions ! Kindly let me know the limitation also. I downloaded the trial mailmerge addin but it doesnt seem to register on my system. I can’t even find it in my list of programs. I have attempted this on three occasions already. Any ideas why that is ? Most probably, you installed the app as another user (e.g.Administrator) with the setting “Only for me”. Please uninstall the add-in and start new installation, but select now “For everyone who uses this computer (all users)” in the 3rd Installation Wizard step. To uninstall, you could either find the app in Control Panel-> Programs and Features, or run the same setup file – and select “Remove”. To enable the add-in in Outlook 2010-16, please point to File-> Options, highlight Add-Ins in the left block, then locate drop-down options in the bottom and choose “Disabled Items”-> Go. Enable the add-in there, then point to COM Add-Ins and mark it with the tick. If it is not listed among Disabled Items – please remove the tick from its check box in COM Add-Ins, click OK, then point back – and put the checkmark. Either add-in option will be added to Outlook toolbars/ribbons, or you will get some informative notification. You need to restart outlook before it will work. I would like to send a personalized attachment via Mail Merger (Word document and Excel file with tags and email addresses for recipients) as a pdf file. In the email itself, I’d like to add a static subject and body message. How do I do that with your tool? In order to do that, please select the “PDF, Attachment” mailing format in the Mail Merge Toolkit Window. A window will appear, allowing you to edit the message body separately. We have replied to your trouble ticket (#61915) with a solution. Please let us know if you have other questions or notes. Just downloaded the toolkit to mail merge with individual attachments, for some reason it will not send the emails and just sits waiting/trying to process, it seems the paths to the excel spreadsheets are causing the issue as it sends out the emails when not including the attachments – i have checked the paths to the excel sheets and are all correct though so not sure what else i can try – any ideas? I will be using Mail Merge to send a series of reports to distribution lists that I built in Excel. I have tested a variety of situations over the last few days. I have found the system very flexible. It’s fairly reliable, but occasionally, Mail Merge will not attach the files to a group of emails. Is there a way to stop the macro from merging messages and sending them, if I see a problem? Once I go back and re-select the file, everything seems to work fine, but I don’t want to send a series of messages without files to a long list of recipients. >> occasionally, Mail Merge will not attach the files to a group of emails. The programme should display a notification informing you the file can not be attached – if you can see that one, one please select the mode “skip for this message” and check which files are skipped. Please check if they are available in their directories for your current user at the moment. If you select a data base field with the path to your file, please make sure full file name is specified there – including full path and the extension of your file. If you do not get such notification, and messages appear without attachments in Outlook, please contact us in trouble ticket or via e-mail – we will provide you detailed instructions for emptying temp folders. >> Is there a way to stop the macro from merging messages and sending them, if I see a problem? under File-> Options-> Advanced, please disable “Send immediately when connected” (please also check your settings for Send/Receive groups – they might be configured for sending by schedule). After that, your messages will just stack in Outbox – until you click manually on “Send/Receive” or “Send All”. Our software completes its task when messages are placed into Outbox. If an issue occurs with numerous messages at your mail system, please ask first both your mail server administrator and your mail service provider – they may have limits for outgoing mail. Or, please look at your recipients: if you have too many recipients at the same domain – your recipients’ server may consider that actions as spam. Hi! I am having some problems sending out around 360 emails using mailmerge as my recipients was not able to receive my emails but those emails are already in my sent items. What can be the reason behind this? Does the mailmerge have limited amount of emails to be sent at a time? I am hoping for your prompt reply. Thank you! The registered add-in version does not impose any limits (with the trial version, you will get a notification after 50 messages, so you will know exactly about the limit – I believe that is not the case). The add-in completes its task when all messages are places into Outlook Outbox. The system (Outlook + mail server) sends your messages further from Outlook – and all sent messages appear in the Sent Items folder. Here, Outlook completes its task as well. So, if your messages are present in Sent Items – that means both the add-in and Outlook sent them. And if your recipients have not got them, we can assume an issue has occurred with the mail server – either your mail server filtered your outgoing mail (and your mail server administrator can check that), or the recipients’ servers rejected incoming messages, or filtered into Junk/Spam. Please ask your mail server administrator – probably, they got non-delivery reports from your recipients’ server. But sometimes incoming mail server may block message without reporting. Hi! We already coordinated with our mail server but they did not find any stuck email. Yes, when I used mail merge all my emails appeared in the Sent Items folder. With our mail server seemingly ok, what could have been the problem with the transmission? Hi! Just an update. When we are sending 10 e-mails only. Recipients got their respective e-mails. We really are puzzled with this because mail merge seems to be working as well. Although, when we are sending e-mail blast of roughly 360 emails, they don’t get transmitted. Btw, is there an easier to talk with you guys? Is there any option in the mail merge toolkit to password protect the attachments while doing the mail merge? Mail Merge Toolkit generates messages with attachments from within Word and Publisher and delivers them to Outlook. If your files are password protected, you can attach them to your messages as well. But if you need a tool to protect your files with passwords upon sending them – you will need a tool for Outlook. You can attach as many files as you wish to your individual messages: please click on the “…” button next to the “Attach” field. New dialogue window will open – for managing all your files in the list: attach static files, add your data source field with the path to your file, and remove your previously added files from the list. If I’m using Excel as my data source, how is this done ? Could you please watch the video-samle of using Excel data source for sending individual attachments here at YouTube ? But it seem that only one attachment could be attached on each email. It seems there is no methods to attached more than one file for one email. I have tried the above path+filename extension but no attachment is sent. Email is sent to address as are all the field merges in the email but no attachment is sent with the email. In the meantime, please identify the stage at which does the issue occur. Temporarily disable the “Send immediately when connected” Outlook option via ‘File -> Options -> Advanced’, and check the Outbox folder. Does the attachment appear to be present? Please forward your reply to the Support area. I’m trying to use the attachment feature, whereby I can put in the file path into the excel spreadsheet, but it is not working for me. How do I put in the file path, so it will email it! Please make sure your data source contains full file name – with the file extension. This looks pretty good, and after one or two false starts I managed to get it to work, but ahead of sending each e-mail it asked me to confirm that I wanted to send it, and there was no “yes to all” button, so I had to confirm them individually, which rather put a damper on the bulk mail idea – any suggestions? Do you mean a dialogue which requests you to select your Outlook Contacts folder for every message ? We know some tricks allowing to solve that issue with Microsoft Office components: the easiest one is to use the regular Word option “Embed image” instead of inserting/linking to the image file.